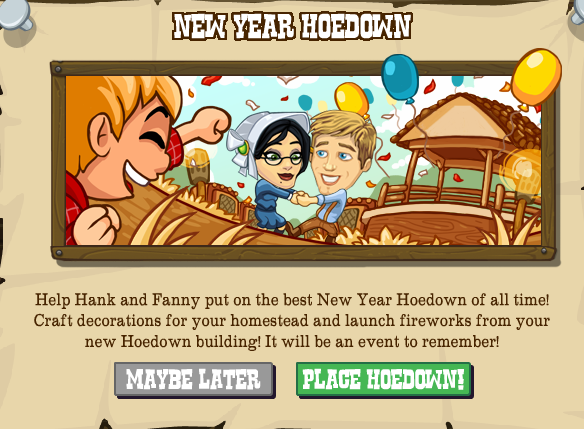 The honeymooners are back, yes Hank and Fanny have returned to the homestead and they're going to throw a party to show their friends how they missed them! 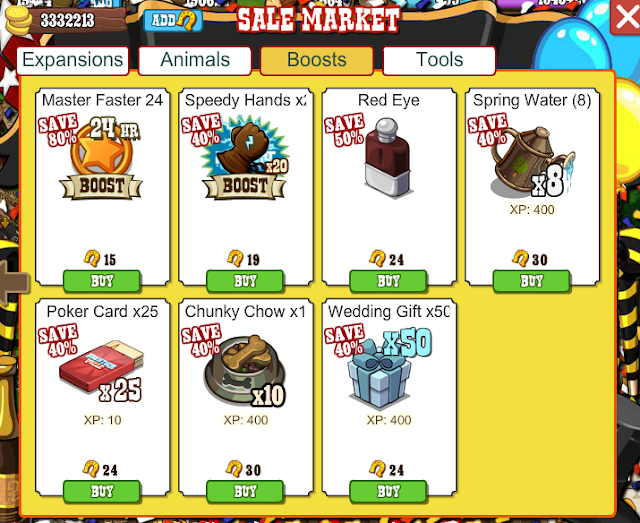 For all the mission details, CLICK HERE. So its time to get your dancing shoes on and swing those partners! 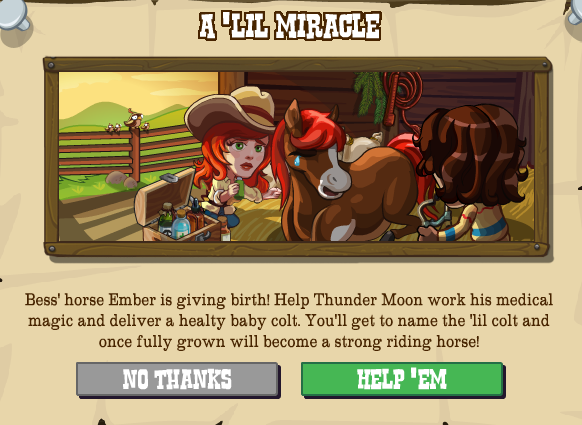 Will you be able to help save Bess' pregnant horse and deliver a nice strong colt? 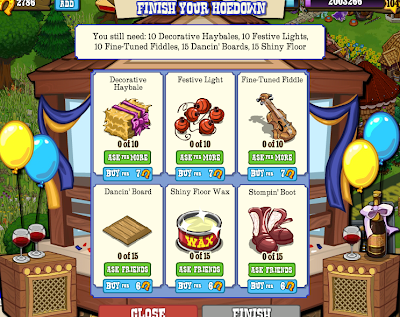 Try the new Wikiwah mission thread, A Little Miracle, to find out! 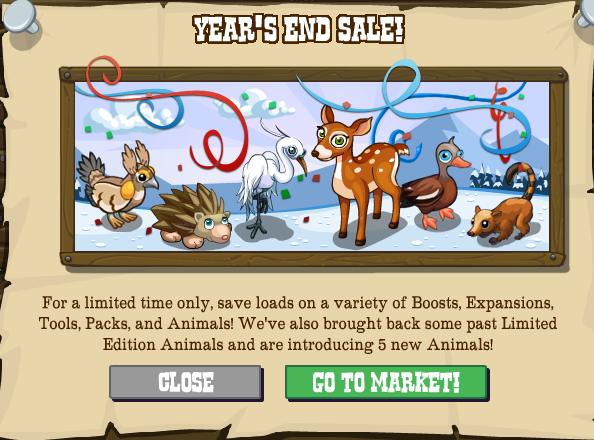 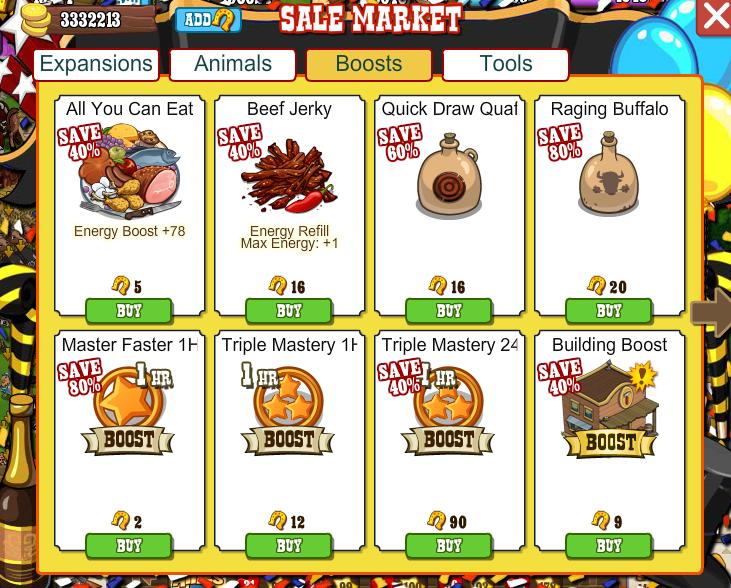 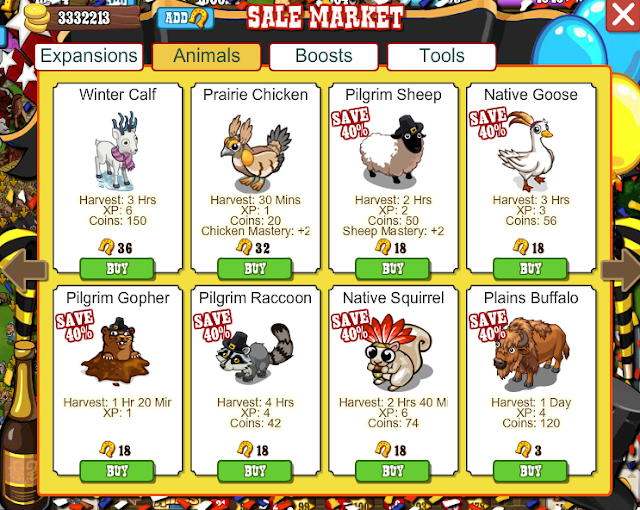 A new End of Year Sale including some new animals and the MONUMENTAL EXPANSION! 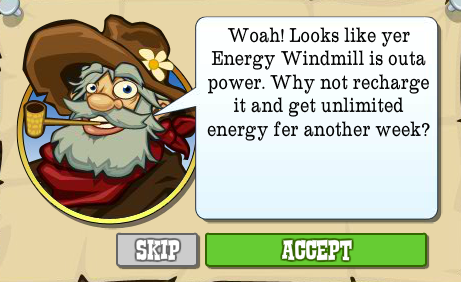 Folks, we have got to the bottom of the Monumental Expansion! 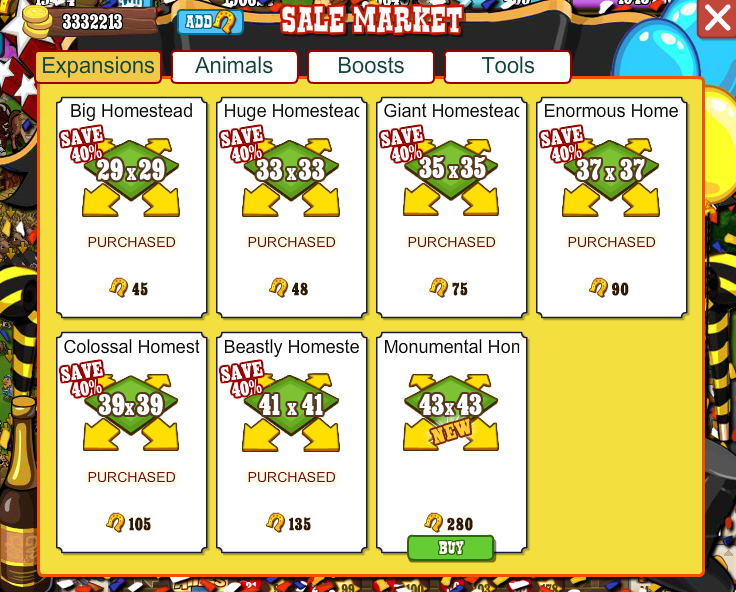 It will VERY soon be able to be bought (for a limited time only) for Horseshoes (280HS). 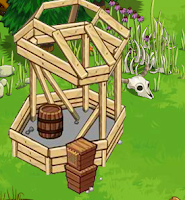 This will be an INSTANT expansion. 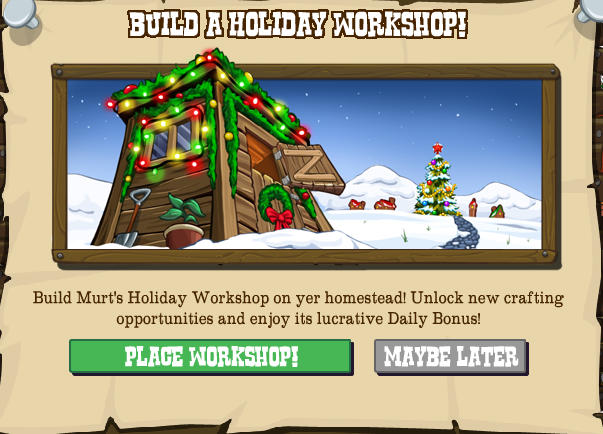 It will hopefully then be available in the new year as a coin purchase with all the missions attached as usual but for now, and for a short time, it's a premium extra. 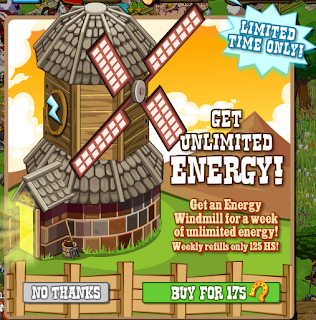 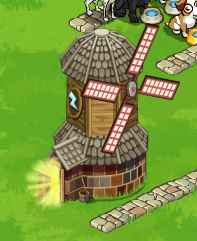 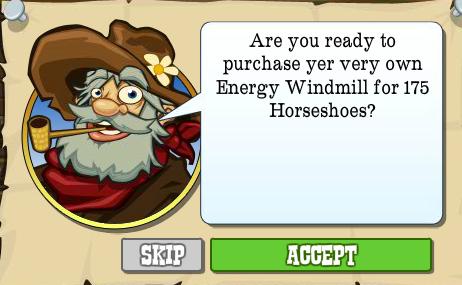 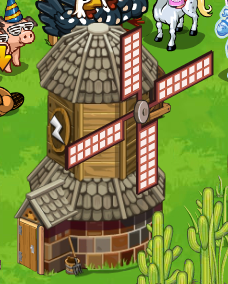 Then, when it's out of charge (after one week) Jack will pop up and let you recharge the Mill for 125 HS, giving you another full week of free energy! 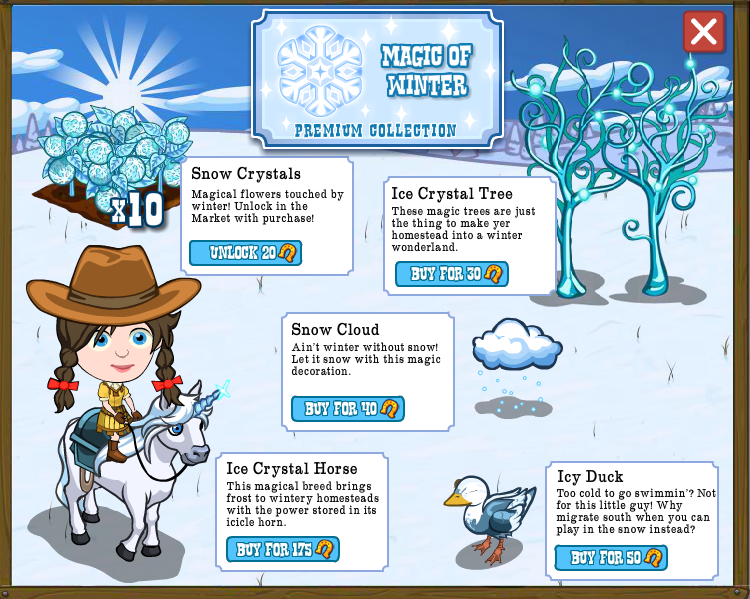 To welcome in Winter on the homestead it's time for a premium collection of items to ice up our homestead! 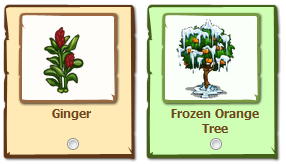 Rather than just give us animals we'll be given crops, trees and decorations as well! The Snow Crystals are unlocked at purchase so you can buy as many as you like. Hundreds of new missions, crops, trees, animals and buildings down... but it's as we slide near the end of 2011 one of the most begged for features (by high level players) is here, the Great Level Cap Raise! 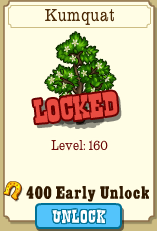 Yep, here comes Level 200! 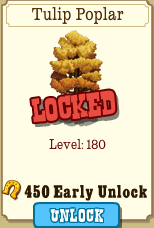 And not only will we get all the usual rewards of a full energy refill and a horseshoes there's a lot more to come with the levels! 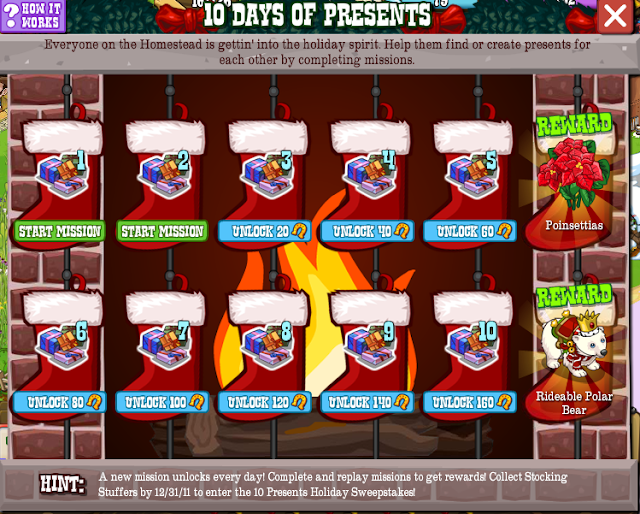 And every 10 levels, something very special! 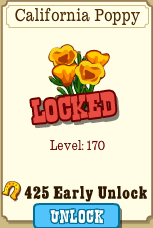 Level 170 - California Poppies! Level 180 - Tulip Poplars! 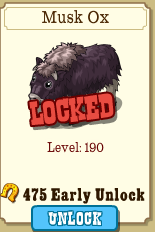 Level 190 - Musk Ox! 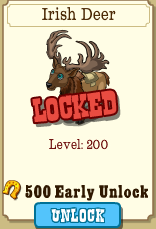 And Finally.... Level 200, the RIDEABLE Irish Deer! 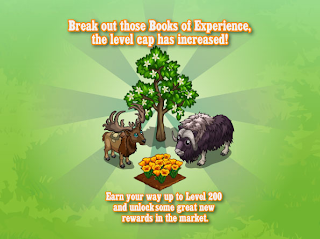 So, are you happy to be seeing more levels? 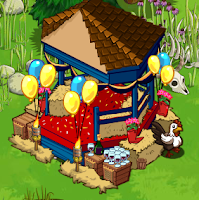 Do you like the new goodies? Come tell us on our Facebook Page. 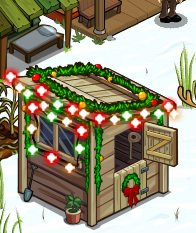 Christmas is about to arrive on the Homestead and what better way to spread the festive to cheer than collecting presents for all our Homestead characters! 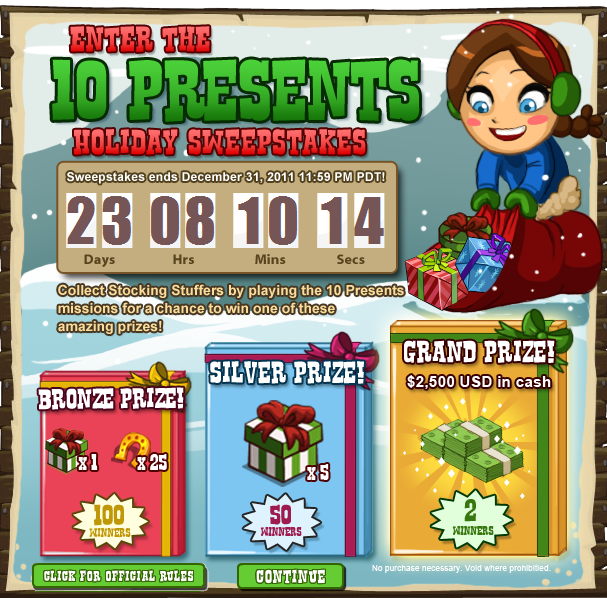 We, in turn will be rewarded with Stocking Stuffers which will unlock some great prizes and enter us into the Holiday Sweepstakes! 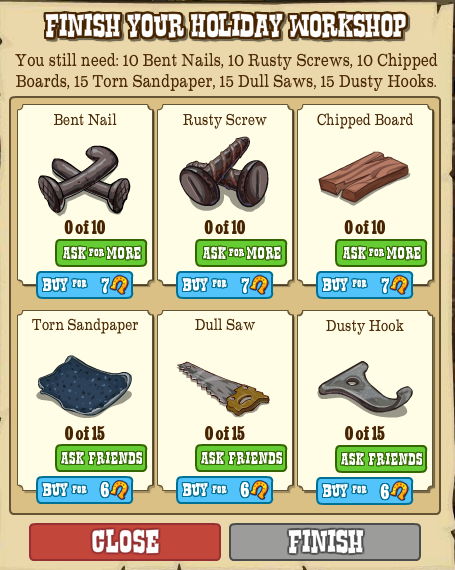 There are 10 REPEATABLE MISSIONS - Each one unlocking 24 hours after the previous one. 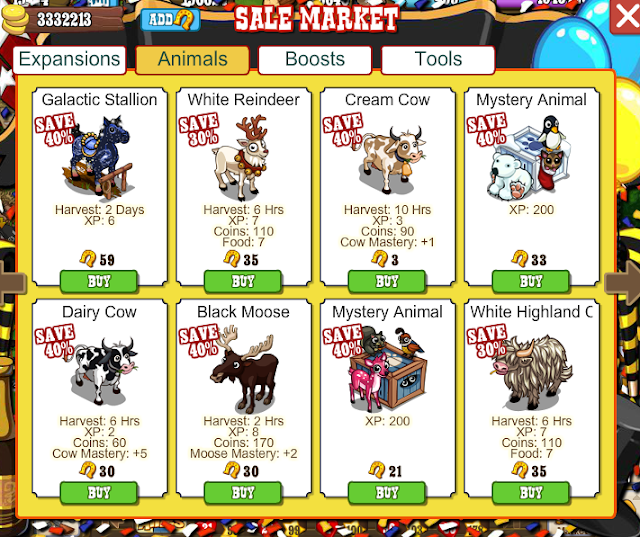 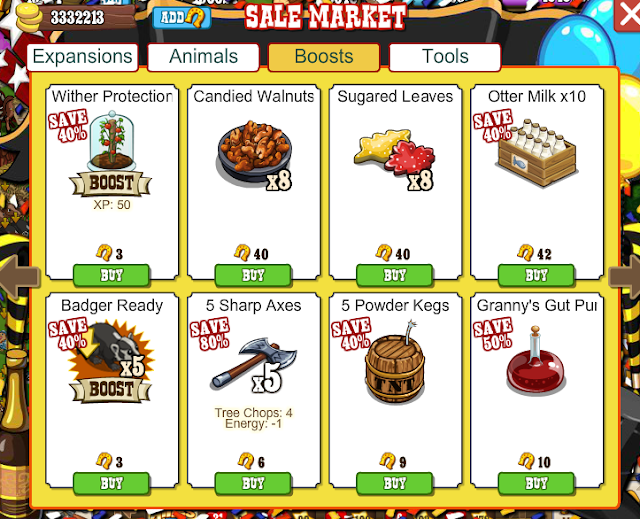 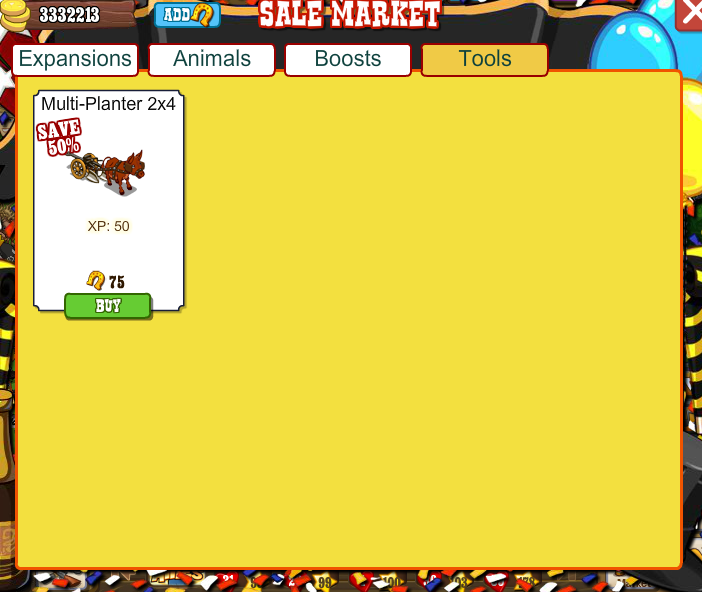 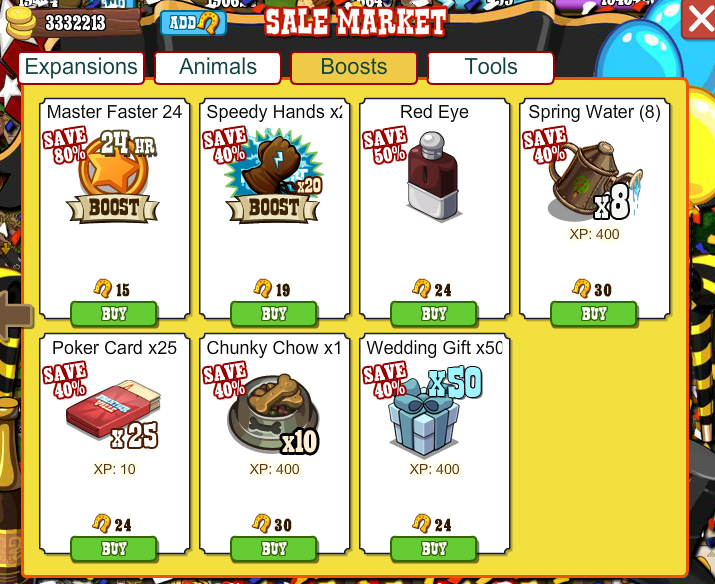 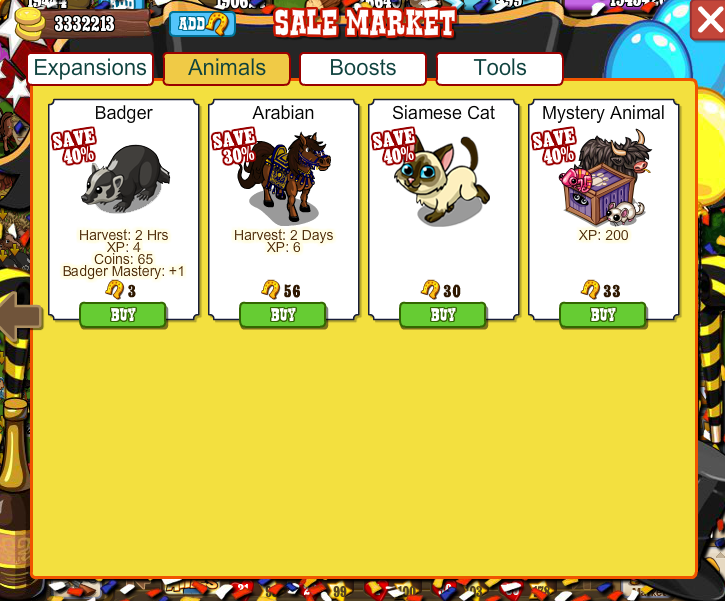 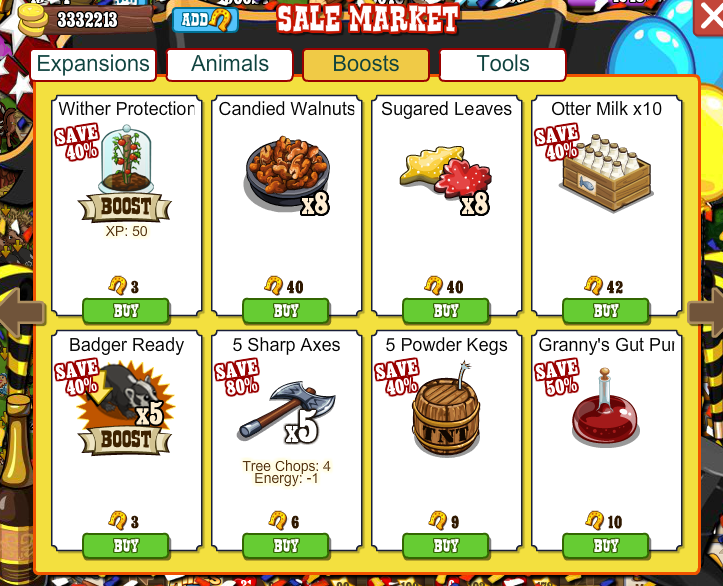 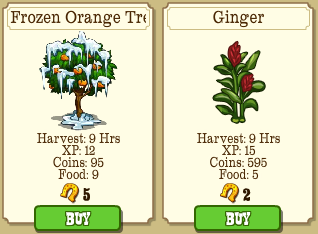 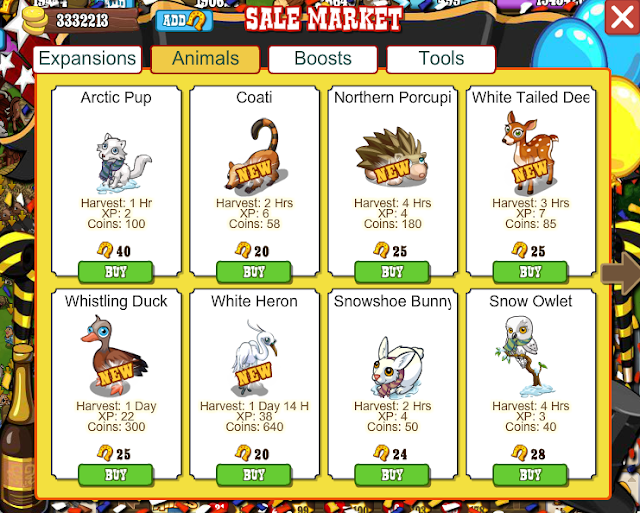 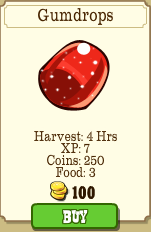 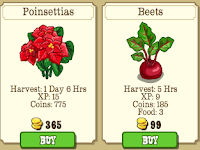 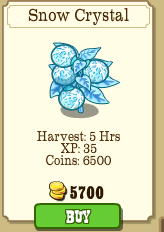 As you can see the Frozen Orange Tree and Ginger are only purchased with Horseshoes BUT look out for them on the FREE GIFTS PAGE - send them to your friends, they will need them in order to complete some of the later missions. 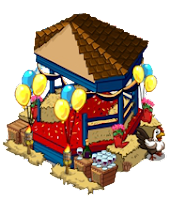 Come and check out our FACEBOOK PAGE for all the latest updates, issues and news! 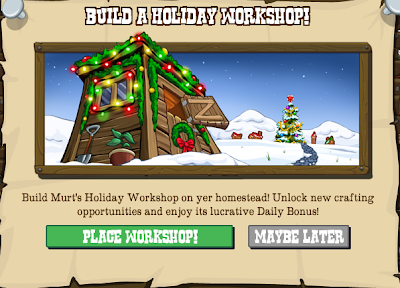 To help out with our Festive Missions in Holiday Hollow we'll be building a Holiday Workshop on our Frontiers! 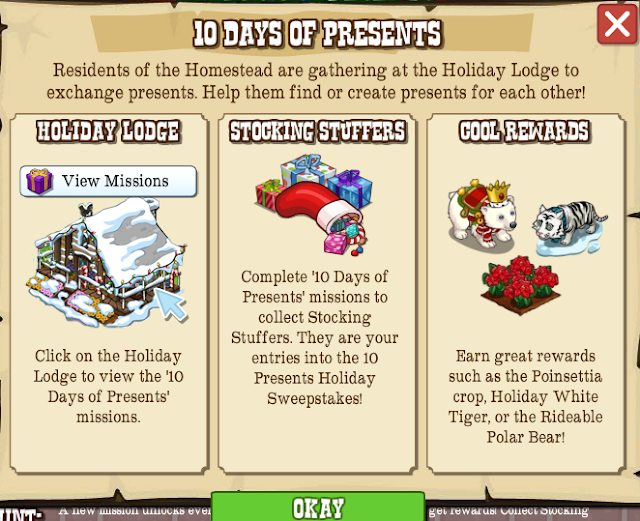 It'll all start off with that most familiar popup on the screen once we get to a certain mission in the Hollow. 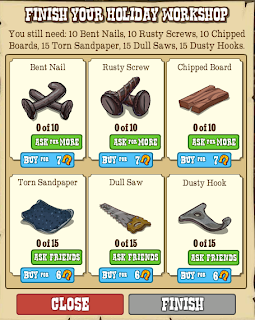 From there it's the now very familiar list of 6 building materials, three to wall request, three to direct request. 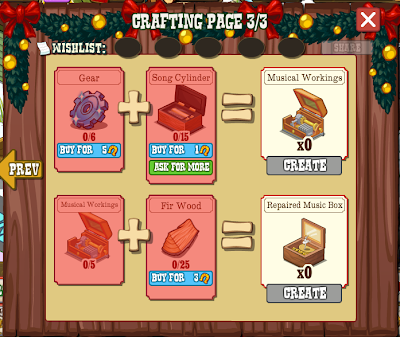 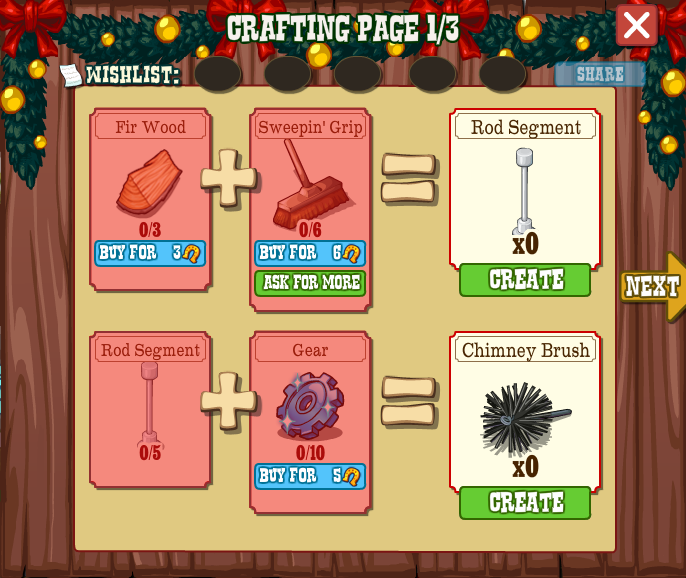 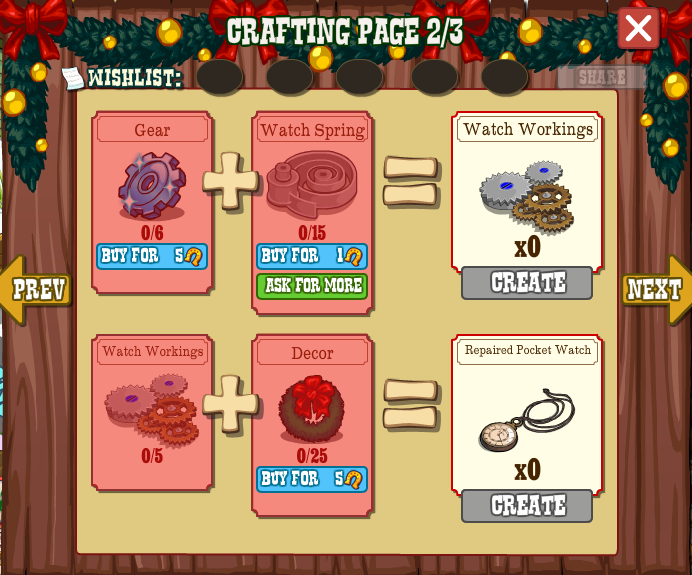 Once built it'll have 3 pages of crafting full of items you'll need in the Hollow!